While the majority of people find it difficult to motivate themselves to hit the gym daily, there are a few like me who would never miss a workout session, no matter what it takes. So, does that mean that you can even workout on the days you aren't feeling well? Will that have an adverse effect on your health and results? Here, let me decipher it for you. Frankly speaking, there's not a complete 'Yes or a No' to this question. It actually depends on the kind of illness that you have and its severity. Before I discuss with you the types of illness and their impact on a workout, I want to give you a general thumb rule. This thumb rule is to avoid a session if your illness symptoms are above your neck. But what if the symptoms are below the neck? Now let me briefly explain this with examples. Though it is always recommended to follow your doctor's advice, it is possibly safe to work out if you have conditions like cold and cough. Let me discuss them in detail with you. From sneezing to a stuffy nose, a common cold can even lead to mild headaches. You can continue with your workout if you have a mild cold. 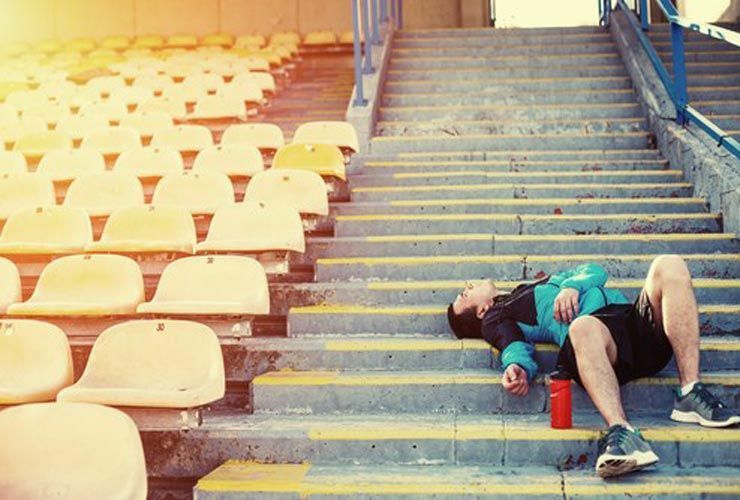 If you feel a little weak in energy, make sure to reduce the intensity of your workout. The only thing to keep in mind while working out with a cold is to take proper care of hygiene or you might just rub it off on to people around you in the gym. Here we are talking about a mild sore throat caused by seasonal viral infection. A mild cough is something that can be managed with regular workout. However, if the symptoms of a sore throat include high fever, you need to take rest. The duration and intensity need to be low until the time you are experiencing the symptoms. Make sure to stay hydrated by gulping plenty of liquid during and apart from your workout. Stomach and digestion problems like vomiting, nausea, and diarrhea are serious health issues and should not be taken lightly. Though the reason could be as common as food poisoning, you need to take extra precautions if you have any of these symptoms. You already face a great risk of dehydration and on top of it, if you decide to work out you are just stretching it too far. These illnesses also make you feel weak from the inside as your body is not able to absorb nutrients from what you eat. Therefore it is better to take off from your workout and rest. Though the reasons for fever can be many, it is commonly caused by bacterial and viral infections. Fever is generally followed by body pain, muscle aches, and headache. You feel lethargic and your strength comes down gradually to a very low level. High temperature in fever means that your body is trying to fight an infection. Therefore when your body is already fighting a battle against infection, it would be stupid to make it go through a stressful activity. Even if you try, you will not be able to do your workout with half the intensity. The best way out in such a situation is to rest and wait for your body to recover completely. Anuj Tyagi is a Certified Personal Trainer, Certified Sports Nutritionist and Therapeutic Exercise Specialist From American Council on Exercise (ACE) . He is the Founder of thewebsite where he provides online Training. Though a Chartered Accountant by education, he has been closely associated with Fitness Industry since 2006. His motto is to transform people Naturally and he believes that the secret formula for Fitness is Consistency and commitment towards your Training and Nutrition. You can connect with him throughFacebook andYoutube.